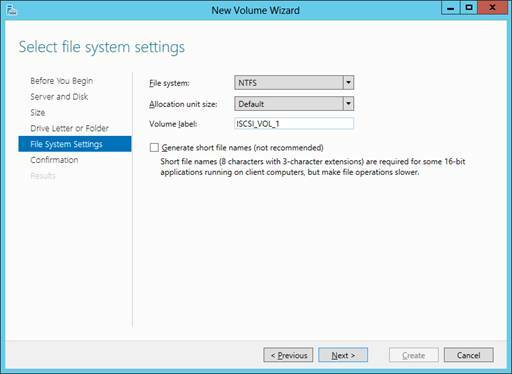 Before we look at how to provision iSCSI volumes on Windows Server 2012, let's review our walkthrough up to this point. 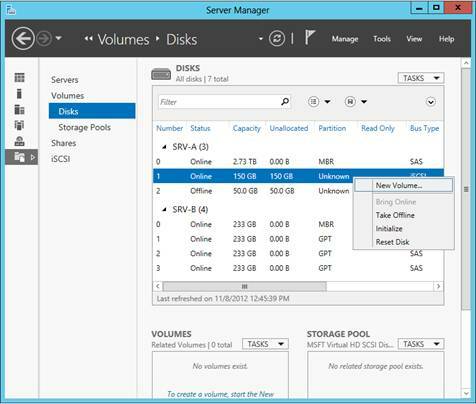 Figure 1 shows two servers running Windows Server 2012 that we're using for our walkthrough. 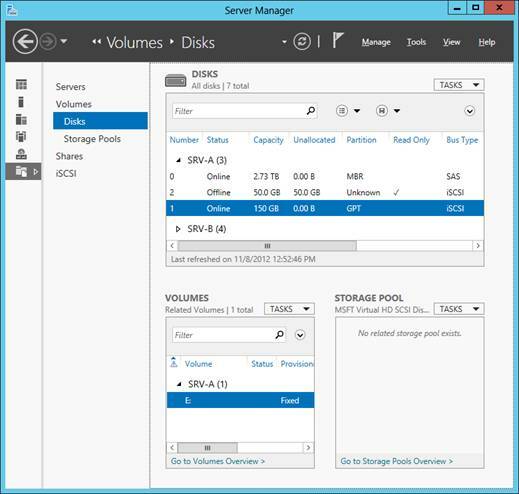 SRV-A is our application server that consumes iSCSI storage. The iSCSI initiator has been enabled on this server, and the initiator IQN is iqn.1991-05.com.microsoft:SRV-A.adatum.com. 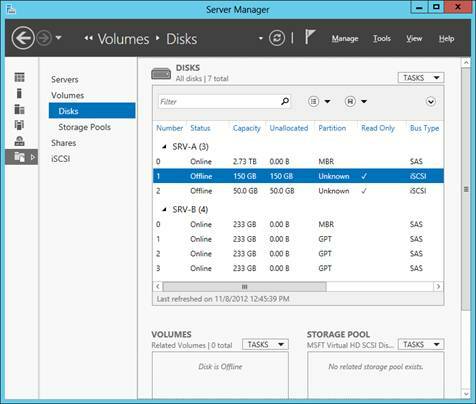 SRV-B is our storage server that provides block-based iSCSI storage to the application server. SRV-B has direct-attached storage (DAS) in the form of four SATA drives attached to a hardware RAID adapter that uses a SAS bus connection. The RAID adapter has been configured to expose the drives as individual physical disks, that is, no striping, mirroring, or parity has been configured. One of these drives hosts the operating system, while the other three drives are our data drives. 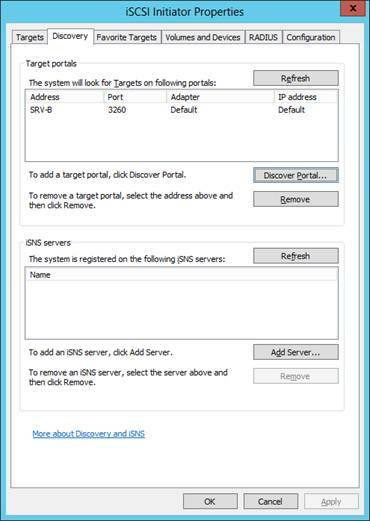 The iSCSI Target Server role service has been installed on the server. 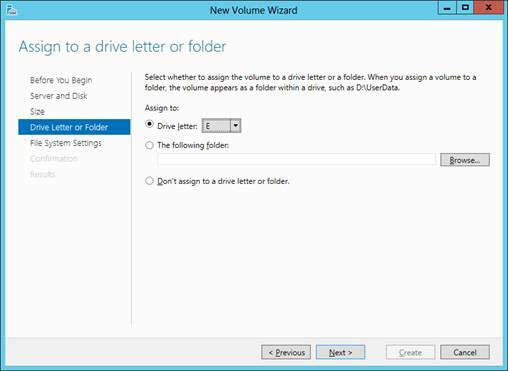 The three data drives have been brought online and formatted as NTFS volumes named X, Y and Z drive. 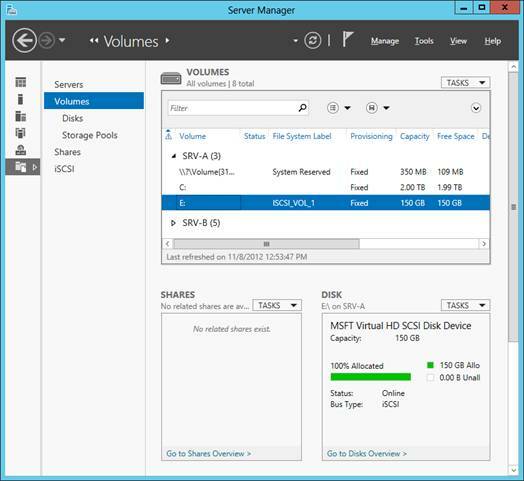 Two iSCSI virtual disks have been created on X: drive. These virtual disks are backed by the VHD files vdisk1.vhd and vdisk2.vhd in the iSCSIVirtualDisks folder on this drive. Two iSCSI targets have been created on the target server. Their target IQNs are iqn.1991-05.com.microsoft:SRV-B-target1-target and iqn.1991-05.com.microsoft:SRV-B-target2-target and the targets are assigned to virtual disks vdisk1.vhd and vdisk2.vhd respectively. Figure 1: Where we are at in our walkthrough. Configure the iSCSI initiator on SRV-A by discovering available targets in the environment for the initiator to connect to and establish a connection between the initiator and one of the available targets. 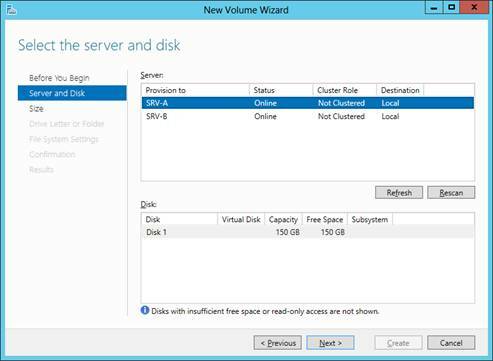 Provision a new iSCSI volume for SRV-A and use it just like you would use a local volume on the server. We will perform all of the above tasks on our application server SRV-A. Figure 2: Step 1 of configuring the iSCSI initiator. Figure 3: Step 2 of configuring the iSCSI initiator. Figure 4: Step 3 of configuring the iSCSI initiator. Figure 5: Step 4 of configuring the iSCSI initiator. Figure 6: Step 5 of configuring the iSCSI initiator. Figure 7: Step 6 of configuring the iSCSI initiator. 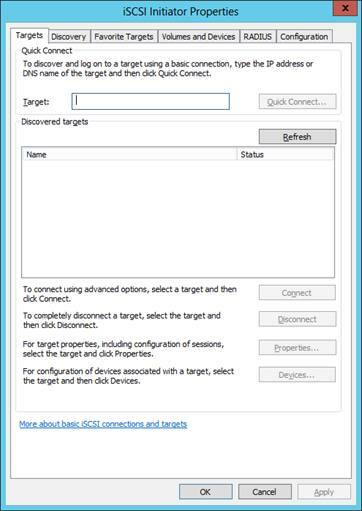 Note that by default after we connect to the target it will be added to the list of targets on the Favorite Targets tab of the iSCSI Initiator Properties dialog. 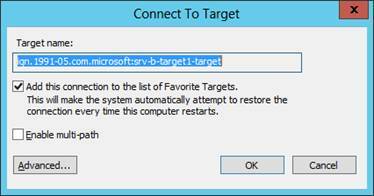 If a target is listed on the Favorite Targets tab, the initiator will attempt to automatically restore connection to that target whenever the initiator computer is restarted. 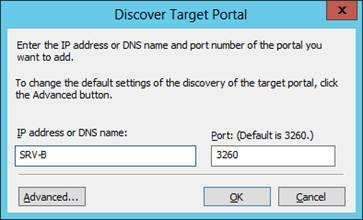 Figure 8: Step 7 of configuring the iSCSI initiator. There are also other configuration tasks you can perform on the iSCSI initiator if these are needed. For example, you can use the RADIUS tab to configure Remote Authentication Dial-In User Service (RADIUS) authentication by specifying a RADIUS server in your environment. Unlike CHAP authentication which is peer-based, RADIUS authentication happens between a RADIUS server and a RADIUS client. You can also use the Configuration tab to do things like change the initiator name, configure a CHAP secret, configure IPsec tunnel mode addresses, and generate a report of all connected targets and devices. Note that if the initiator computer has been restarted, the Get-IscsiTarget cmdlet may not return any results unless you refresh the list of targets discovered by the initiator. 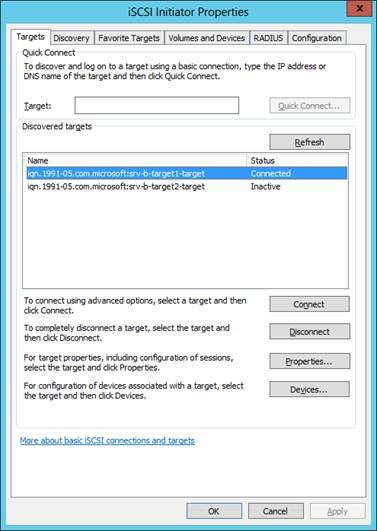 You can do this either by clicking the Refresh button on the Targets tab of the iSCSI Initiator Properties dialog or by running the Update-IscsiTarget cmdlet on the initiator computer. PS C:\> Connect-IscsiTarget -NodeAddress "iqn.1991-05.com.microsoft:SRV-B-target2-target"
PS C:\> Register-IscsiSession -SessionIdentifier "fffffa8013fd8430-4000013700000003"
If you now click Refresh on the Favorite Targets tab of the iSCSI Initiator Properties dialog, the connection to target2 should now be displayed. 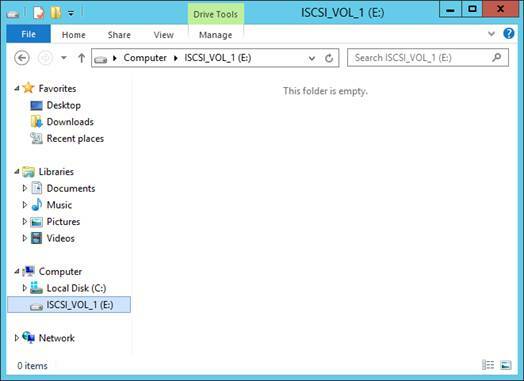 Figure 9: Step 1 of provisioning an iSCSI volume. Figure 10: Step 2 of provisioning an iSCSI volume. Figure 11: Step 3 of provisioning an iSCSI volume. Figure 12: Step 4 of provisioning an iSCSI volume. Figure 13: Step 5 of provisioning an iSCSI volume. Figure 14: Step 6 of provisioning an iSCSI volume. Figure 15: The new iSCSI volume has been created. Figure 16: Another view of the iSCSI volume. Figure 17: The iSCSI volume behaves like a local disk. The new iSCSI volume on SRV-A behaves just like directly-attached disk even though it is actually located elsewhere on the network. If we copy a file to it, the bits for the file will be transmitted over the network using the iSCSI protocol. And if we read a file from, the bits for the file will again be transmitted over the network using the iSCSI protocol. 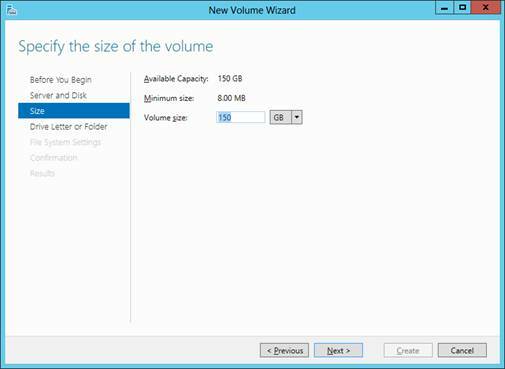 But from the perspective of applications running on SRV-A, volume E: is just another local volume on the server. 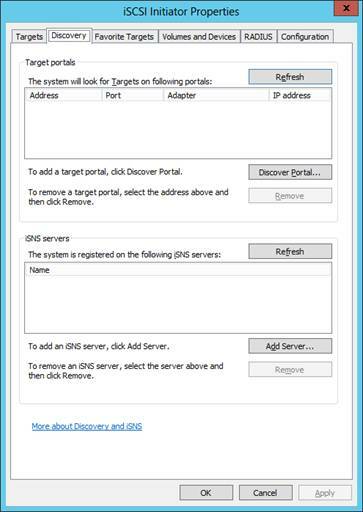 For more information about the iSCSI Target Server role services on Windows Server 2012, see this link. For syntax and examples of Windows PowerShell cmdlets for managing the iSCSI Initiator and iSCSI Target Server on Windows Server 2012, see this link.